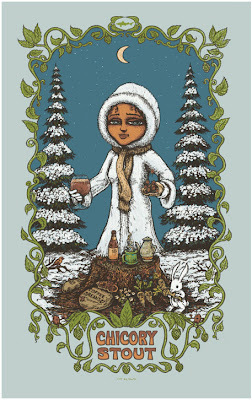 So I was finally able to purchase the final Marq Spusta print in the Dogfish Head Goddess seasonal collection. Here are the other three, if you haven't seen them. I've been stalking "Goddess of Gear" Lindsey over at the brewery for weeks now. No, really, I am not joking. In between emailing her and suggesting bribes to get a pre-order done, or at least a good unpublished hint as to when the sale would start, I wasted more time in the Dogfish store, on Twitter and on Facebook than I care to admit. Actually, I don't even have a Facebook account since being banned over there around a year ago for using a fake name (Beer Drinker Rob, how deceitful! FU FB). That's not exactly truthful--I have a Facebook account that I use for work, funny enough, to stalk clients that owe my company money. I have two "friends" and "like" nothing! So after I made my purchase, I started chatting with Lindsey a little more. She told me she thinks Dogfish will work with Marq Spusta again in the future (which is awesome), but his turn is done as far as doing a full year of their seasonal beer prints. Next year, David Plunkert will be working with Dogfish on this series. Can't wait to see what he comes up with! Anyway, thank you, Lindsey, Marq and all of Dogfish Head. Also, I just got my UPS notification that the print is on its way, and I'll be sure to post a picture in the coming weeks. 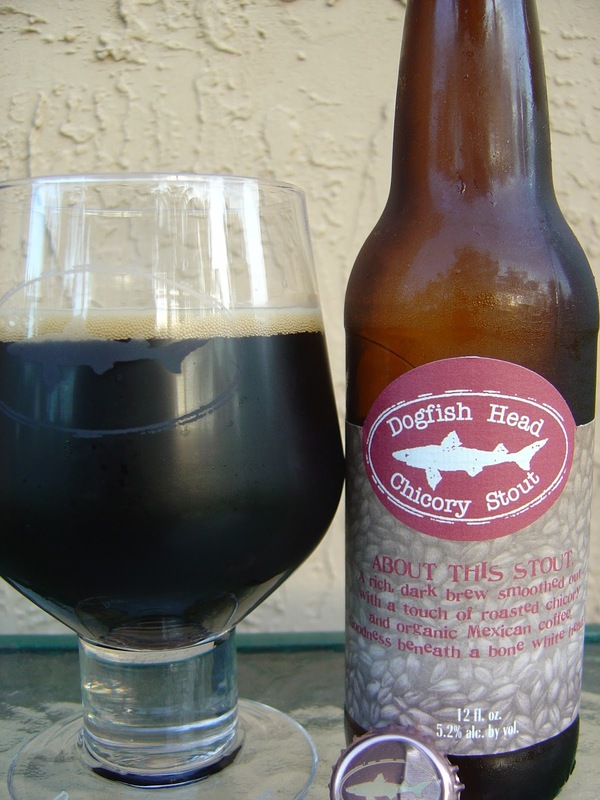 In celebration, I'm drinking, yep you guessed it, Chicory Stout brewed by, yep you guessed it, Dogfish Head Craft Brewery in Milton, Delaware. I first drank this beer back in March, 2009 and apparently I wasn't a huge fan. Simple label, brick red colors on top of a light brown coffee bean patterned background. Bottled on 10/06/10 C.
Roasted malt and coffee aroma, not too powerful but nice. I really had to stick my nose into the glass. Flavors are much richer leading the way with a strong roasted coffee. Right behind that is a large dose of smoke along with some bitter chocolate. There is a little hoppy bite, yet Chicory Stout remains balanced. A faint licorice pokes in from the background before you end with a smooth, dry finish. The 5.2% alcohol wasn't noticeable. Simple beer, nice flavors, still not my favorite, but I can see why people love this every winter. Check it out when you can! Here is a banner I lifted from the Dogfish Head website. And here is a picture of the actual poster that I ordered. I'm not sure that this is the paper color I will receive, but that is the print. Oh, and since this was one of the copies that Marq sold, it doesn't have the embossed Dogfish stamp at the bottom. Sorry about your dad. Glad you have some nice memories. I am pretty sure that what you saw is a poster made like this print. I don't see it on the Dogfish Website, but I will ask some of my contacts there if they sell it or have any leads. Rob! I just had this beer for the first time this week, and I have to say I loved it. A buddy also tried it though, and he felt about the same as you. So apparently I am an outlier; for my palate this is a fantastic, A+ beer. I think that your friend and I are probably the outliers, and you are closer to everyone else. There is a distinct flavor. Glad you liked it. PS, I linked to your review in the one I just wrote over on FIWK. Hope that's okay. Of course it's OK. You can post your review link here if you want. That's cool.